From Uncle Moishy to OyBaby. In Jewish life, music is incorporated into prayer and reflection, moments of sadness and comfort, and times of joy and togetherness. Jewish music for children does all this and then some. In the United States, this genre tends to follow the trends of the secular kiddie music market, while addressing uniquely Jewish topics like holidays and customs, and offering a Jewish spin on sheer childhood goofiness. Lullabies may be the oldest Jewish children’s music. Lullabies, classically sung live by parents to their children, are usually sung in whatever language the parents speak at home. But they do not always cover the most soothing bedtime topics. Many other classic Jewish lullabies speak with quiet resilience, even a touch of sadness, about learning Torah. In a Yiddish folk tune, “Oyfn Pripetshok” (“On the Hearth”), famously used on the Schindler’s List soundtrack, a rabbi teaches young boys the Hebrew alphabet. “Though there are tears in every letter,” the rabbi explains, the children will gain strength from them while in exile. A Ladino lullaby, “Durme Durme” (“Sleep, Sleep”), eases children to sleep with the reassurance that in the morning they will study Torah, and that learning is filled with beauty. There is no denying the power of lullabies as oral tradition, but today there are some compelling recordings of lullabies on the market. Tanja Solnik’s From Generation to Generation: A Legacy of Lullabies (1993) includes soothing, masterful versions of both “Oyfn Pripetshok” and “Durme Durme.” JDub Records’ 2009 release, Songs from the Garden of Eden (featured previously on MJL), is also an excellent collection, including beautiful versions of lullabies as well as more upbeat tunes from all over the world. While lullabies may be its most enduring subgenre, Jewish children’s music has evolved in several new directions since the mid-20th century. In the 1950s and 60s, when Disney dominated the secular children’s music market, Gladys Gerwitz, a Julliard graduate and music director of the first Camp Ramah, began producing records for young Jewish children. Like Disney’s recordings, Gerwitz’s songs had a fairytale aspect to them, complete with exaggerated animal characters and irritatingly sing-able melodies that the modern listener might find simultaneously endearing and grating. Through Gerwitz’s work, music became a powerful tool for Jewish education and identity formation. Her songs deal primarily with Jewish customs and holidays, and celebrating the newly established State of Israel. In Gerwitz’s record Mother Goose Songs for Jewish Children and Holiday Play Songs, she and narrator Eve Lippman inject Jewish themes into familiar American children’s songs; Little Boy Blue, for instance, cannot watch over his sheep on Shabbat–he is in shul, of course. The young boys on the cover all sport kippot and Mother Goose is pictured in a matronly shawl, with a prominent Star of David around her neck. Starting in the late 1960s and early 1970s, following the release of children’s hits like Sesame Street and Schoolhouse Rock, a few major players came to the forefront of Jewish children’s music. These musicians were deeply influenced by the prominence and style of the folk singer-songwriter in secular America, and most were affiliated with the Reform movement in Judaism. Acoustic guitar in hand, they incorporated Jewish liturgy and concepts into original lyrics paired with upbeat melodies that are Hebrew school and Jewish summer camp staples to this day (Debbie Friedman’s “The Aleph-Bet Song” still runs through many a frustrated yiddishe kopf trying to remember the order of the Hebrew letters). English and Hebrew prevailed over Yiddish as the languages of choice, and themes revolved around Jewish values, customs, and holidays, with some plain silliness tossed in the mix. Rabbi Joe Black’s “Build a Sukkah” (1998), for example, is a quirky, bluesy homage to a family’s temporary home, and Larry Milder’s off-beat tune “Wherever You Go (There’s Always Someone Jewish)” is the ultimate tribute to Jewish geography. Orthodox communities soon produced their own stars of the children’s music scene. Abie Rotenberg’s three-volume set The Marvelous Midos Machine, released in 1986, is now considered a classic. The albums pick up on the storytelling style of earlier artists like Gerwitz, as well as Hasidic singers/storytelling masters like Rabbi Shlomo Carlebach. 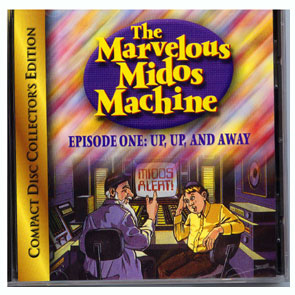 The science fiction-esque adventures of Dr. Midos and his machine were designed to help children behave their best by using Jewish values. Moshe Tanenbaum, otherwise known as Uncle Moishy, is probably the Orthodox world’s biggest hit. Uncle Moishy, with his ruddy face and giant letter mem propped proudly on the front of his black hat, has been making music with his band The Mitzvah Men since 1979. Their tunes are always bright and engaging, focusing on topics like Shabbat, kashrut, and tzedakah. Beginning around the turn of the 21st century, some more experimental Jewish children’s performers have taken the stage. They play with every genre from reggae to rap, and they touch on universal themes and values as well as particularly Jewish concerns. Few claim allegiance to a Jewish denomination. Like children’s acts such as The Wiggles and VeggieTales, their projects and shows are varied, adding multimedia enhancements and engaging Web 2.0 to develop their message and audience. Mama Doni (whose album covers cast her as a hip, Jewish Lucille Ball peddling Yiddish delicacies) focuses her songs on the joyful idiosyncrasies of being a Jewish kid, from livin’ “La Vida Dreidel” to bringing a pet gefilte fish to school for show-and-tell. Matt Bar’s Bible Raps project, which has gained a strong following in Jewish overnight camps across the country, examines and expands upon the lives of biblical characters through the rhythm and energy of rap/hip hop. Naomi Less, whose persona is rock and roll to the core, brings a message of confidence and self-esteem to girls through the poppy, Hebrew-laced tunes of Jewish Chicks Rock. The popular new series OyBaby aims to please infant and old alike with its sweet, cleanly harmonized versions of classic Jewish songs, often accompanied by videos of dancing puppets and groups of happy Jewish children. There is more to come from the world of Jewish children’s music. Its artists are maturing and changing alongside their audience, and there’s no telling what they could grow up to be. Where to find recordings and lyrics for classic (and modern) Hanukkah songs.